Every new year brings with it the excitement of what could be. We all start contemplating what we've accomplished and goals we hope to achieve. As I look back at my blog and business for the year 2012, I see some great accomplishments. But I also see many things that would both make my business better or improve the quality of my blog for you…the reader. Specially, I want to focus in 2013 on blog content that is both more interesting to read and more valuable to those who stumble onto my small piece of virtual property here. Please continue reading to find out how I plan to accomplish that below. But first, I think its appropriate and helpful to look back on what happened last year. Rather than try to document everything I learned, accomplished, or failed at here in writing; I made a highlight video for 2012! Prepare yourself to be “wowed” by my mad video creation skills. Enjoy the music video below! 2012 in Review – Music Video! I am both amazed and honored when I look back at the amount of readers and active community that has grown here at NichePursuits.com in 2012…thank you! Please watch the video for a more complete review of 2012 – and perhaps a chuckle. As the community grows here, I both feel the need and want to be more helpful. This is going to be a focus over this coming year, providing more actionable advice and real world case studies. I think I've done a fairly good job of explaining strategies that work for small businesses and niche website creators how to take advantage of long tail keywords. 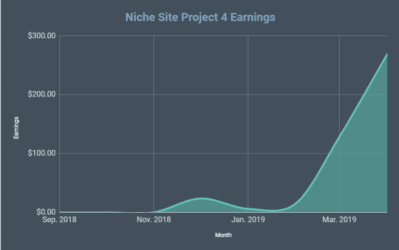 The niche website hub has become a valuable resource for those looking to research nearly all aspects of how to build a niche site. But despite this resource, I'm finding that I'll never be able to cover everything or answer every question. That's right. I plan to build from scratch, at least 2 niche sites and document the entire process here on my blog! This includes sharing in depth how I go about finding a niche and specific keywords. In addition, I'll share exactly how I outsource content, get the site up and running, and get links to the site. I'll also be sharing the URLs and all the stats associated with these sites including traffic and earnings. I know that many others have shared niche sites publicly, including fellow blogger Pat Flynn. The success of Pat's Niche Site Duel is well known. I honestly don't expect my public niche site project to ever become as popular as Pat's; however, I think the value provided to YOU the reader could potentially be huge. I've always hesitated to share any of my niche sites publicly for one major reason: My income has always come primarily from my niche sites. I've been concerned that if I start sharing my niche sites, I would put that income at risk because people would either copy my sites or cause other problems in my business. However, in the past 2 years I have been diversifying my income. 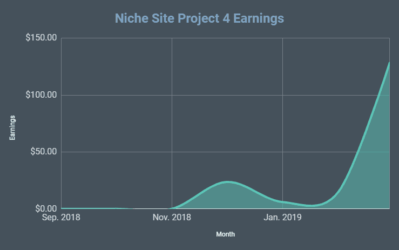 I truly hope to continue increasing my niche site income (as you will see from my goals below), but if for some reason this public project puts my niche site income at risk, I have revenue sources outside of my sites. In short, I'm more comfortable sharing things publicly now. I know this is something that many readers have wanted me to do for a long time. I also know that as a reader of other blogs, I always enjoy following along with public projects; whether or not they are a big success. 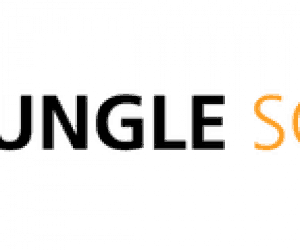 I hope to begin the first public niche site project in early February, maybe sooner. The second public niche site will come in the second half of the year. Since my site is called “Niche Pursuits”, I think its only appropriate that I actually try to complete one! 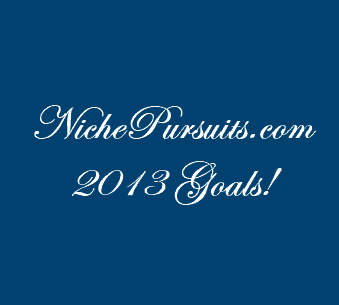 What is a Niche Pursuit? Well, as you can see from my original explanation here, its essentially a bootstrapped business idea. The idea is to let YOU the reader vote (like I did before) on a small business idea that I should pursue, and then I will indeed start that business and document the entire process here. My first niche pursuit was building an iPhone app, that you can read about here. To be honest, these niche pursuits were going to be all I talked about on the blog here. However, due to the overwhelming response I have received from readers to share more about niche sites, SEO and niche sites have become the primary topic. So, be on the lookout sometime in the first half of this year for your opportunity to “vote” on which “Niche Pursuit” I should start. This could be anything from starting a Kindle eBook business to buying and selling used books. I'll let you decide! This goal will not be easy to accomplish. I'm very pleased with how big this blog has gotten in just under 2 short years. However, doubling a good sized blog into a bigger blog is not a simple task. For reference sake, in 2012, NichePursuits.com received 199,598 Unique Visitors. So, I need approximately 400,000 unique visitors in 2013 to hit my goal. Wow, that's a lot of people! I started this blog in March 2011. In 2011, the blog had 59,094 unique visitors. My plans to hit this huge number of visitors is to provide more value and keep things interesting here. A big part of this will be the public projects I complete from goals 1 and 2 above. However, I also plan to be a bit more social, network with other bloggers, and drive traffic in other ways. To be honest, I make very little from affiliate sales here on NichePursuits.com. Most months I make less than $1,000 from affiliate sales. The reason is that I don't have very many affiliate links on this site. 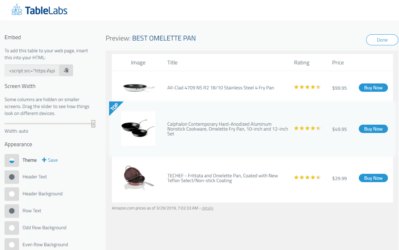 There are only a handle of posts here that even mention affiliate products. I don't plan on stuffing a bunch of posts with affiliate links, don't worry! However, there are several products that I consistently use that I believe in. Through the process of providing better reviews of products and doubling the size of my blog, I expect that I should at least double the affiliate income here. This is a big one for me. I really want to show that creating a business with niche sites is still a viable revenue source. Obviously Google has changed quite a bit over the past year, but this just means we need to change how we approach niche sites a bit. I've seen great early results with my new processes. Doubling my income from niche sites (not from other sources), will not be simple. However, I think the potential is there and it will be a big focus this year. I enjoy reading good books, I really do. However, I often find myself too busy (3 kids can do that to you) to sit down and enjoy a book. But if I plan well, I should be able to find a few minutes during meals or other times each day to finish off at least one book a month. I would really love to hear your feedback on my goals! Do you think they are feasible? Or am I overly ambitious in any of them? Let me know. In particular, my public niche site project has me the most excited and apprehensive. I've never shared any of my sites publicly here on my blog, but I've made my decision. Do you think its a good one, or is there any reason I should reconsider? Overall, let me know if you are interested in following along with my public projects and what you think of my goals! What Happens When You Add 500 Pieces Of Content To A Website? Welcome to the Authority Site Project! 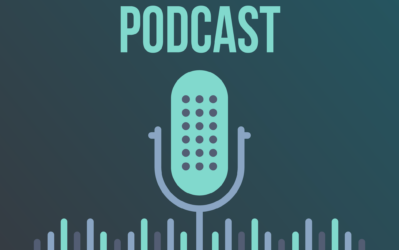 Podcast 12: Running a Landscape Business Like a Tech Company! Hey Spencer- Best of my wishes. I think it will turn out to be a great year for you. Looking forward to seeing the niche sites. This sounds like a great plan. I think all of the goals you laid out are entirely reachable. Ambitious yes, but doable, totally. I especially like the plan for the niche sites. I will be one following this process very closely. I’ll likely be creating my own right alongside you as you do this process. Of course it will be in a different niche and not competing. So, don’t hesitate and get started already! I suspect that by following through on the bigger tasks you’ve defined (the 2 niche sites and the niche pursuit), you will see the traffic increase to your site naturally. So by focusing on those tasks and continuing to keep the word out there about those projects, you’ll see the traffic goals met naturally. I look forward to following along in the coming year. I appreciate all you do and wish you the best success this coming year! I am really excited that you have decided to share a few of your sites. I think watching you build out a site will provide huge value to your readers and may help you hit goal #3 of doubling the visitors to your blog. Good luck and I can’t wait to follow along! Thanks Matt, it should be pretty interesting for everyone involved. I agree that it could help me accomplish other goals as well. I am very curious about your method of building 2 new niche websites. It will give me an in-depth view in your method. Spencer, your link ‘small piece of virtual property here’ has a misspelt URL. Thanks Nick 🙂 Fixed it. Good luck and best wishes for 2013, Spencer. I think your plans sound very exciting. I will definitely look forward to the niche site case studies for sure. The only caveat with sharing the URLs, I think, is any possible blow to your AdSense account. So for me, if I was doing it, I wouldn’t put any Adsense on the site for the duration of the case study. I’ve seen this happen a couple of times where people give the URL and then a bunch of people click on their ads, thinking they’re being helpful… but if the referrer shows as your own blog, then Google can see that as driving traffic specifically for clicks. Karen, glad you are interested in the case studies! I agree that Google Adsense is a concern. I know of a couple of plugins that can block multiple clicks coming from the same ip address, so I will likely use one of those. I definitely DON”T want anyone from NichePursuits clicking on my ads! I’m guessing if you put the url in plain text, rather than hyperlinking it, that would effectively hide the referrer. I definitely think you’ll need to add a “CAUTION: PLEASE DO NOT CLICK ON ADSENSE!” to every post you make here, to be on the safe side. I would not plan on linking to my site from here – great advice to be safer Karen. I think your idea of sharing two niche sites is excellent. Sure it’s been done, but I think you bring something more to the table because of all the success you’ve had and you’re going to use LTP instead. Your other goals sound great as well. Good luck to you and I look forward to seeing your public niche sites. Thanks Greg…everyone does things a bit different, so people may learn something different from me than they learned elsewhere. Congrats on the success and overcoming the obstacles you had in 2012. 2 suggestions, WE WANT MORE CONTENT!!!! I think I can speak for other followers of Niche Pursuits, I really enjoy reading your posts and following along with what you are doing and what you are struggling with, keep it coming. And secondly, you said that you would like to read 1 Business book a month, why not share what book you’re reading with us. Maybe create a category on this site so we can talk about the book. I’m a once a month book reader myself and would love to get your input on what you’re reading and get insights from others that are reading the same book. I was thinking about which niche pursuit I would like to see someone tackle. I’ve been listening to 4-Hour Workweek and I’m interested in the muse business idea. How about you start selling a physical product? Either something you come up with or something you put a private label on. Just a thought. Ambitious of course, but if anyone can do it you can. I read somehwere that 97% of people trying to do well online (miney making wise) fail. And they give their money to the 3% that succeed. I’d like to be one of the 3% but I haven’t had much luck so far. Anyways, I love the idea of you letting us guide where your next niche pursuit goes. I think as far as getting more people, there are probably more ways to extend your presence online, on twitter, facebook, tumblr, linkedin and so on. Since you are so successful, I think being more transparent about your pursuits as you plan to, is a good idea. Good luck and I’m looking forward to 2013. Spencer, I dedinitely like the idea of seeing how you build out a niche site. If you are concerned with people reverse engineering all your niche sites I would avoid using your Google AdSense code on it. Also, if you will be sharing the URL right away then you may want to think about the competitiveness of the niche you are going after. If its an uncompetitive niche than the people who copy your site will be more a problem than if you went after a more competitive niche where an additional competitor copying you would have a marginal impact on your site. As far as your next project I think seeing you build a SAS for a niche unrelated to niche pursuits would be really interesting and successful for you…your experience building software and getting traffic to niche sites could combine nicely and I am certain be valuable to a lot of readers! Best of luck with your ambitious goals! Maybe I should just monetize with an affiliate offer instead. I’ll have to consider my options on that one. I like your idea for a niche pursuit as well! I think the world needs more public niche sites as some of the methods Pat used I wouldn’t recommend now, and you look like you’re crushing it with your new methods. Spencer! Nice to hear about your goals! You have become into my role model and I am really happy for all the new challenges you have set for 2013! I considered myself really lucky to find your blog because it was the first blog I found that it is actually teaching me something new. 1 month ago I had absolutely no idea on Niche sites, google’s algorithms, and Adsense. Thanks to your experience sharing I found a light at the end of the tunnel. I am really looking forward to see all your goals coming true. I’d just like to virtual high five you on your song choice for the video. Tron soundtrack for the win! Yep, always enjoy a little tron soundtrack 🙂 . Hope your year goes great as well! Awesome Spencer, thanks for all the great info in 2012. I am with you on reading at least one good book a month.. what I need was open a Audible account and that allows me to listen to the books is much easier to listen that to sit and read a book, well at least for me. I also think you should do a niche dual with a few of your readers. I will be interesting. It will be a motivation. You can select just a few readers, maybe create a criteria to qualify and we can challenge each other to see which niche site is more successful. I’ll have to think about how a “duel” might work…but either want, I want you guys to be involved. Marc Bell @ Marc Bell Marketing. Dude, I really enjoyed you video! Being someone who has been creating and editing videos for a couple of years now I’ll say you did a great job. I’m all in for you to share how you create your niche sites. There are many niches and enough cash to go around, you know ; ) Plus it’s always a pleasure to learn from someone with your level of expertise about niche sites. Your goals are obtainable. As you displayed in your video, its going to take hard work though. But accomplishing a little each day will add up over time, resulting in reaching your goals. As a father of 2 girls ages 2 and 10 months, I definitely understand how difficult it can be to find time to get things done, especially reading. I do most of my reading when my are in the bed. Peace and quiet! I enjoyed reading about your goals Spencer! Happy New Year Bud! 2012 had many ups and downs for many of us in SEO. Glad to see you’ve bounced back (I luckily know the feeling!). I’m curious, which blogs do you read? I’m really excited about your decision to share your process. As a recent happy buyer of Long Tail Pro I hope to pick up on some advanced reseat techniques from the master. Thank you! Just thought I would pop in and say hello. Still enjoy reading your posts and following along from time to time. Keep up the great work! Great to see you are still reading along Chris…thanks for stopping by! Nice video Spencer. I especially like the Carlton Dance! Looking for your 2 public site build… All the best for your 2013 goals! Thanks for being such an inspiration to others! Nice to see how well you have set up a road map for your site(s) improved performance for this year…. When I saw the traffic numbers you are pursuing for 2013, I noticed they were close to the amount I have suggested as being a great figure to build a solid foundation on. 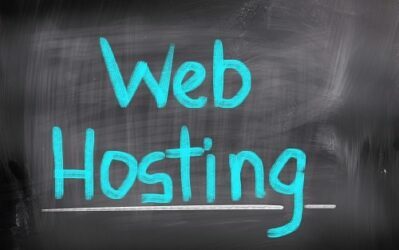 Though, it would all come down to how much of that traffic is targeted, as there are many sites with much larger traffic numbers that are not achieving their potential…. I am looking forward to seeing your process of the 2 public niche sites. You have an ambitious goal to double you niche sites income, but Im sure you can pull it of. Just a couple quick comments. 2. Regarding point 4, don’t forget that people (like me) do value a step by step guide, video courses etc, even if it’s something you’ve already done live on the blog. Give even a bit more specific depth, a few extra resource tips, a private area or some personal coaching etc and you’ve got a course to sell on this site. Just don’t think that you can’t do that – different things meet different people’s needs. All the best and here’s to a great 2013! Spencer – epic year in review video! Those unique visitor number for your first year blogging (2011) and this year are amazing. Can’t wait to see the niche site from scratch information. A lot of my initial success has been based on stuff I’ve learned from you, so thank you. Good luck in 2013! Just Nathan and Tess here wishing you the best of success in 2013! We’ll be doing our own niche site duel as well (husband vs wife… maybe not my wisest decision…), and we’ll be following your’s extra closely! I am very excited to follow your niche site building process. Also, I can imagine how scary it would be to share everything publicly. I can’t say that I have done much of that. I look forward to the posts. Wow, Spencer! Glad you got to vacation with the wife. My 15th is in a few weeks and I’m not going to be able to get away. Anyway, I just posted some goals for myself on the blog. We’ll see how things turn out. Let’s add some value and stay focused! Today is the day I unsubscribe. Thanks for this. One thing that I would be interested in reading about is how you structure your authority niche sites and why, how you manage internal links, etc. Hey Spencer! It took about 3.5 years to get to 200K visitors a month on Financial Samurai. One suggestion is to go visit some of your frequent commenters site and comment back. Expand the niche if you will. Also, the only real strategy is to just increase the writing frequency. There becomes a lot of synergies as your portfolio of content builds. After a while, you’ll have less and less of a desire to spread yourself among so many sites, and more a desire to focus on just one or two! I didn’t realize you have 3 kids. I haven’t seen you talk about them before. Makes it all that much more impressive to me that you are able to accomplish so much working from home. I also have 3 kids and have to wake up in the wee hours of the morning in order to get any of my online stuff done. I would love to see more, and more regular, podcasts from you. That might seriously help you build your brand and accomplish your goal of 400k. I also like the reader suggestion for a Niche Pursuits book club, where we all read the same book and talk about it in some sort if hub or forum. An incredible 2013 to you and all of your readers! Looks like a difficult year overall but you made it through nicely and in the end still made some great profits. Keep up the fantastic work Spencer! I hope to join you in having an awesome 2013 with big explosions in my business. Time to get lazer focused and continue to work hard everyday to make my dreams a realty. Frankly, the video was enough for me. I’m pumped! Thanks, I really needed to see that.